BeMused Music: Aesop Rock, Float, Free Album Download! Be the little guinea pig, dig? Over the summer, I found a box in the basement: “Emily’s Old Art Box”. Team by Bon Iver, in my mind this photo (I took in oregon) and Team by Bon Iver (free mp3 download, click the link) are conjoined twins, where one elicits the other. Change is an illusion . History is Bleating 3 tense’d repetition of time. like the sound of a siren. Essence of Consciousness never Exhausts Itself. I am telling the truth. My head is tied to the present momento. Heads planning future and ruminating past playing foreshadows and replaying present past, so it seems to me, those heads are in the clouds, clouded murky sour milky way. Therefore, psychotherapy, as a political discipline, witnesses, records, and transmits these on-going experiential communiqués from and dialogues with this numinous/ transformative realm of being. In some ancient cultures, every citizen was believed to be a vehicle for this living numinal dimension, for this living will and voice of the gods as mediated through human experience. The public sphere, the common marketplace of political interaction and achievement, was the Polis. This Polis was the living organism of Eros, of numinal energy flowing into the public heart and soul of things. Every life had a Destiny that served an aspect of this living, shaping, creating, numinal core of individual and cultural psyche. A well lived life was a life unfolded in a conscious, loving seeking out of this Destiny and, then, serving it with as much thoughtful, loving, and compassionate dedication as possible. Privately, this service would be to loved ones and vocation; publically, this service would be an engaged political interaction with one’s fellow citizens. Everyone is politically engaged. Some are simply more aware of and disciplined about that engagement and its attendant social responsibilities. Every act in the public sphere is a political act, an act that builds up more loving and compassionate connection to the living numinous or tears it down. But every act, conscious or unconscious, aware or unaware, is a healing or destructive political act. We are all citizen politicians. We all have a public duty. We all serve the gods in the fervent hopes that the gods will then serve us and our community and lead us to more light and not more darkness. This brief seminar sketches some clinical and cultural examples of these profound experiential psycho-political transcripts that emerge within or penetrate into depth therapy. Using frequent illustrative images from, especially, contemporary cinema and art, Friday’s lecture opens up the outlines of the model and Saturday’s seminar fleshes out that outline in more depth and breadth. The psychological question now is, How do we house this greater subject that takes up residence in us, radically altering the center from which we live? How do we accommodate this “tremendous stranger,” or this “mysterious density of being”? How do we, how can we, live in relation to it? closely related to anima, which is a feminine form; see anima. The basic impulses and instincts which govern one’s actions. Tibi bene ex animo volo. I wish you well with all my heart. Pre-Motion Premonition: I Knew that earthquake was coming like the next note in a song I’ve never heard but just know. How. Why. Again? Chakra means Wheel in Sanskrit. Consciousness and energy move from one frequency to another in spiraling fashion. The body has energy centers that look like spinning wheels and are called Chakras. 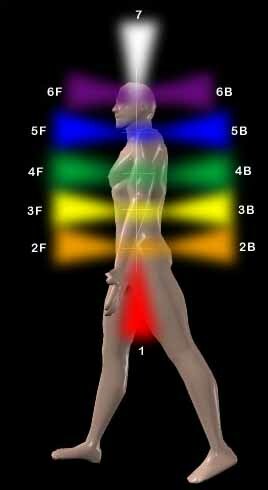 They allow energy to flow from one part of the body to another. As with all things in our reality, they are linked to sound, light and color. It’s all in motion in the alchemy of time. The pineal gland (also called the pineal body, epiphysis cerebri, epiphysis or the “third eye”) is a small endocrine gland in the vertebrate brain. It produces melatonin, a hormone that affects the modulation of wake/sleep patterns and photoperiodic (seasonal) functions. The pineal gland is located near to the center of the brain, between the two hemispheres, tucked in a groove where the two rounded thalamic bodies join. Unlike much of the rest of the brain, the pineal gland is not isolated from the body by the blood-brain barrier system. It is reddish-gray and about the size of a pea (8 mm in humans), located just rostro-dorsal to the superior colliculus and behind and beneath the stria medullaris, between the laterally positioned thalamic bodies. It is part of the epithalamus. It is a midline structure, and is often seen in plain skull X-rays, as it is often calcified. Calcification is typically due to intake of the fluoride found in water and toothpaste. It was the last endocrine gland to have its function discovered. Metaphysics The pineal gland’s location deep in the brain seems to intimate hidden importance. In the days before its function as a physical eye that could see beyond space-time was discovered, it was considered a mystery linked to superstition and mysticism. Today it is associated with the sixth chakra whose awakening is linked to prophecy and and increased psychic awareness as consciousness ascends. 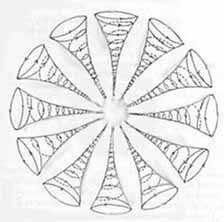 Another notable example of that which may be derived from the Flower of Life is the Tree of Life. 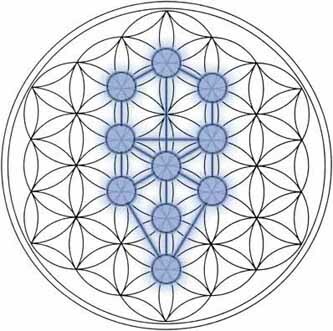 This has been an important symbol of sacred geometry for many people from various religious backgrounds. Particularly, the teachings of the Kabbalah have dealt intricately with the Tree of Life.